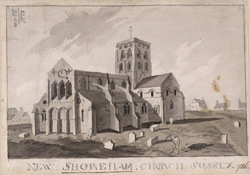 North-east view of St Mary de Haura, the parish church of New Shoreham in Sussex. It has a Norman Central Tower and transepts. The local de Braose family gave the church to the French monastic house of St Florent at Saumur in a deed of 1103. It was partly rebuilt in grander style in 1170, and thus straddles the end of the Romanesque architectural era and the beginning of the Gothic. The size and style of the church is completely out of keeping with other Sussex parish churches.